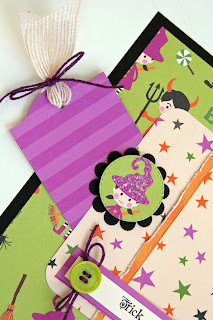 Liz's Paper Loft: My Creative Time Scrappy Monday Layout Challenge! Happy Memorial Day Paper Lovers!!! If you're like me, then you are at the end of your three day weekend :( I so wish I was a stay at home mom again! Maybe not going through the kid stage again, but just being at home! I'm so sorry, I drifted for a moment. hehehe Let me get back to what I'm really here to share with you! So here are the challenge rules: to create any size layout of your choice using only ONE picture & incorporate buttons onto your layout! EASY PEASY! 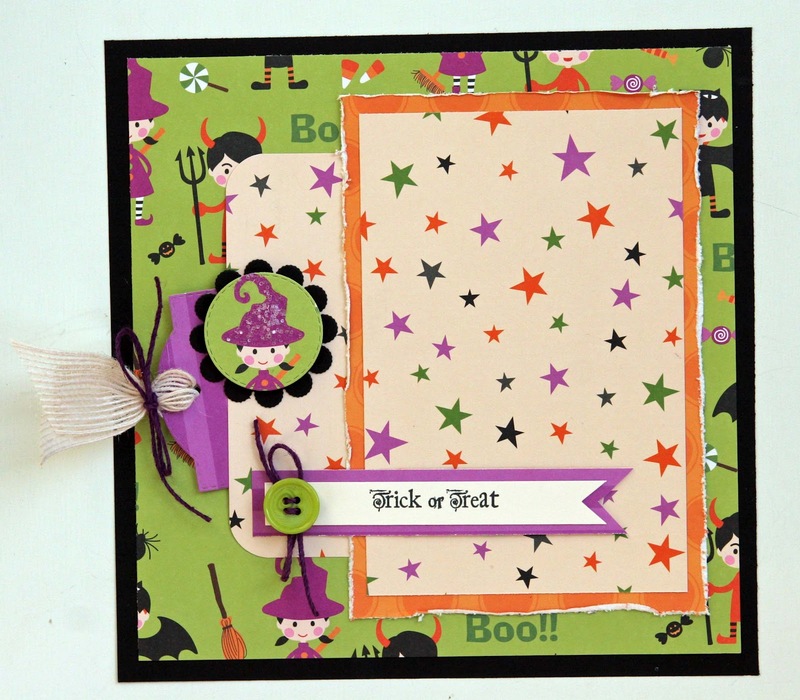 This an 8x8 layout that will accomodate a 4x6 photo, that can be slid under the "trick or treat" banner. Or I can just use a 4x4 photo. I made a pocket for a tag that can be used for journaling! Click here to enter the challenge! Don't forget to check out what my design teammates made! I'll be back later today with another project!!! Hey, I recognize that paper! You're making me like it a lot more! Adorable layout!!! Adorable layout Liz! I love the pattern paper and the pocket tag..super cute! Liz ~ this layout is too CUTE! IOf course I LOVE the papers! What a GREAT idea to use the tag die as a journaling tag! 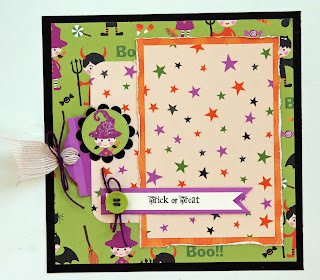 LOVE that you used the stitched circle and die cut out the matching witch! CLEVER! I think it is TOTALLY okay to still want to be home ~ minus the kid stage! LOL! AWESOME job as always! Your layout is so cute...that paper is perfect and what a great purple. I like the tag tucked under the photo. Great job. 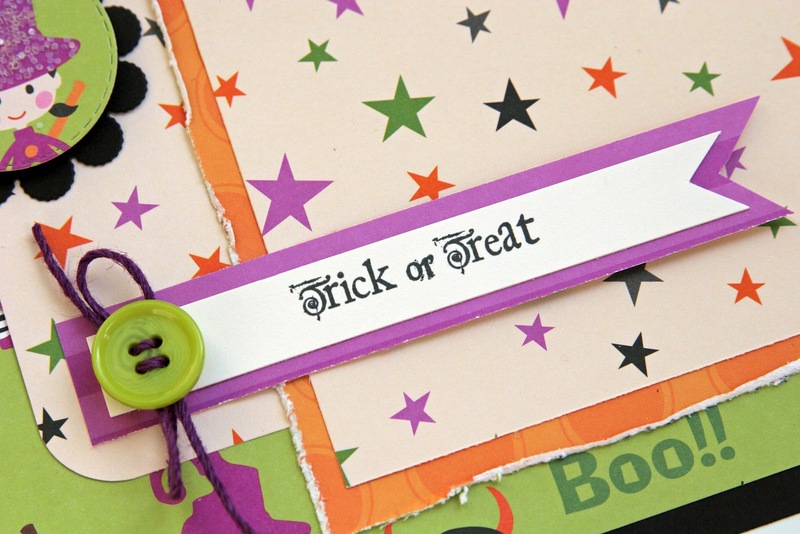 Super cute, love the tag for journaling!